"Immigrants Are a Blessing Not a Burden" campaign welcomes the Grand Rapids community to watch "Documented: A Film by an Undocumented American" on Wednesday, August 17, 2016 at 7 p.m.. Imagine believing you were just like everyone else—and then one day discovering that your future would be very different. That’s what happened to Pulitzer Prize-winning journalist Jose Antonio Vargas when he applied for a driver's license in high school and was asked to leave the Department of Motor Vehicles and never come back. That was the day Filipino-born Vargas learned that he was undocumented and the day his entire life changed. Surprisingly, this isn’t uncommon. Just over 80 percent of undocumented youth do not realize they lack legal status in the United States until they apply for their first job, a driver’s license, or college. Until that point they believe that they have been fully American, but a system then reveals otherwise. There are currently 11 million people in the United States without legal status. What image comes to your mind when you hear this statistic? The film "Documented" challenges us to broaden our understanding of where undocumented people come from and what vocational fields they work in. Stereotypes prevent people from realizing the full span of who is affected by our broken immigration system. Undocumented people are members of our congregations; they are our waiters; they are our children’s friends’ parents; they are our farmers; they are our coworkers; they are our journalists. Undocumented people are working within every sector of our society and come from every country around the world. Vargas kept his status a secret for over a decade, confiding only in close friends and a compassionate employer. He also did not tell many people that he was gay. Deciding he could not live with two secrets, both so integral to his identity, he chose to pick, in his mind, the less threatening one---he decided to come out about his sexuality. Years later, Vargas saw fellow DREAMers, young undocumented people, publicly coming out as “undocumented and unafraid.” He knew he could no longer stay silent on this issue while others were risking deportation and stigmatization. He needed to add his voice to the fight. In 2011, Vargas wrote a piece for the New York Times titled “My Life as an Undocumented Immigrant,” sharing his greatest secret to the entire world. He soon also became motivated to create the film "Documented: A film by an Undocumented American." Throughout the film, people say to Vargas, “Why don’t you just get in line?” There is a narrative surrounding immigration that if you “just get in line” and go through the immigration process the legal way, you will be able to enter the United States. This is one of the greatest misunderstandings of how our immigration system works. The “get in line or go home” mentality is problematic for two main reasons. First, for a majority of the 11 million undocumented people in the U.S., there was no line for them get into when they decided to come, and there still is not one for them today. Second, for Vargas and millions of other undocumented youth, the U.S. is the only home they’ve really known. Here is my understanding of our broken immigration system: the United States economy depends on immigrant labor, but the system does not provide a legal pathway for immigrants, forcing them to come illegally and forcing employers to hire them illegally. Then, once the immigrants are here, they live in fear of deportation. Our 50-year-old system does not reflect our demand for labor or for our market needs. Our system also dehumanizes people and does not honor the work they do or the dignity they have. “We have a workforce that is dependable, highly competent and committed to the success of our business as well as their own well-being,” Randy added, but he admits that this great combination can be hard to find. He continued, “The challenges facing agriculture and horticulture in Michigan are immense. Our most pressing issue is finding a labor force that is willing to work long hours for short periods within each given growing season, depending on the crop being grown.” It isn’t uncommon in Michigan for farmers to mow down crops like asparagus because of labor shortages. Labor is a challenge to secure because U.S.-born workers are not interested in the jobs, and our immigration system does not work well for farmers. The United States gives out only 5,000 permanent visas per year for “low-skilled” workers, which goes well beyond agriculture—and temporary visas are also limited and come with complications of their own. So it’s not surprising that 70 percent of all people working in the agricultural sector in the U.S. are undocumented. We cannot even begin to comprehend the devastation to Michigan’s economy and food-security if all undocumented workers were deported. Despite their hard work and immense contributions within every sector, immigrants around the country are often scapegoated as a drain on the economy. Some politicians even go so far to say we should deport all undocumented immigrants. Economists, however, have a different story to share. According to the American Immigration Council, Michigan, for example, would lose $3.8 billion in economic activity and $1.7 billion in gross state product if all undocumented people were deported. Immigrants are also often accused of taking jobs—however, Michigan would lose approximately 20,340 jobs if all undocumented immigrants were removed. Soundbytes and myths are drowning out the true story of the blessings immigrants are to our communities. In Grand Rapids, Michigan, where I live, it’s important to understand this issue because undocumented immigrants are our neighbors. Undocumented immigrants pay taxes and pay into Social Security, Medicare and Medicaid but will never receive any of these benefits; nor could they apply for welfare. We benefit from a system of injustice and exploitation. Grand Rapids needs to boldly speak the truth about the blessings immigrants are to this city and to the West Michigan community. People with legal status have the privilege of stewarding their voices to elected officials. 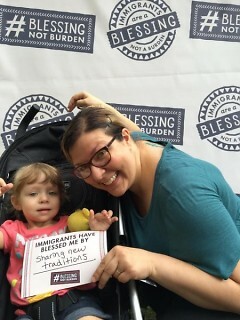 The Immigrants Are a Blessing, Not a Burden campaign empowers people to do this in a focused way. To get involved today, text immigration to 52886 to sign the pledge and change the conversation, and send an email to your Representative and Senators urging them to enact a more just immigration system. 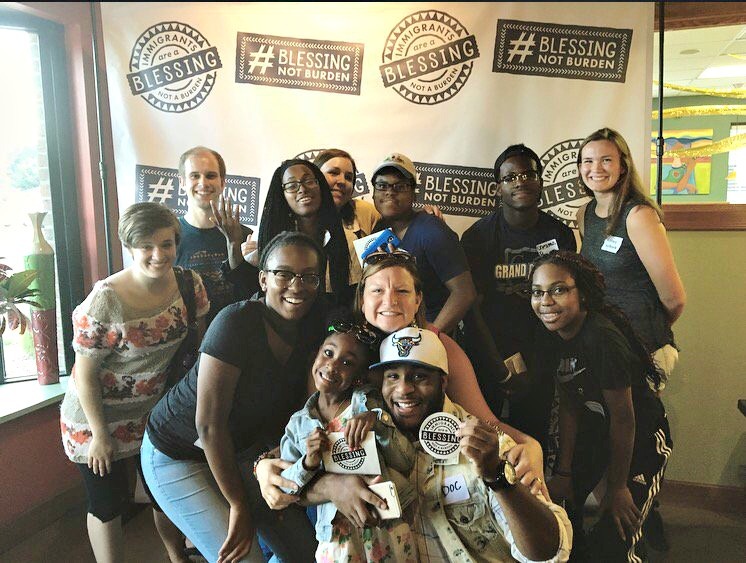 The Blessing Not Burden campaign invites you to join us for a screening of "Documented: A Film by an Undocumented American" on Wednesday, August 17, at 7 p.m. at the Wealthy Theatre, 1130 Wealthy St. SE, Grand Rapids. The film invites us to consider critical questions regarding our collective identity. What is American? Who is American? Is it about where you are born? The language you speak? Whether you have legal papers or not? Or is it about the values you hold, the work you do, and your effort to make communities better? Vargas challenges us to “define American.” In this exploration within myself, I’ve learned it’s far broader and more beautiful than I knew. Written by Kelsey Herbert, the Immigration Coordinator for the Office of Social Justice of the Christian Reformed Church in North America.